Where is Bangkok’s Central Business District? Useful InfoArea GuideWhere is Bangkok’s Central Business District? Bangkok can be a daunting city to explore and evaluate, for Property Investors as it offers a confusing selection of neighborhoods and roads. Interestingly conventional geographical delineations such as postcodes and even districts have very little meaning in this sprawling megacity. 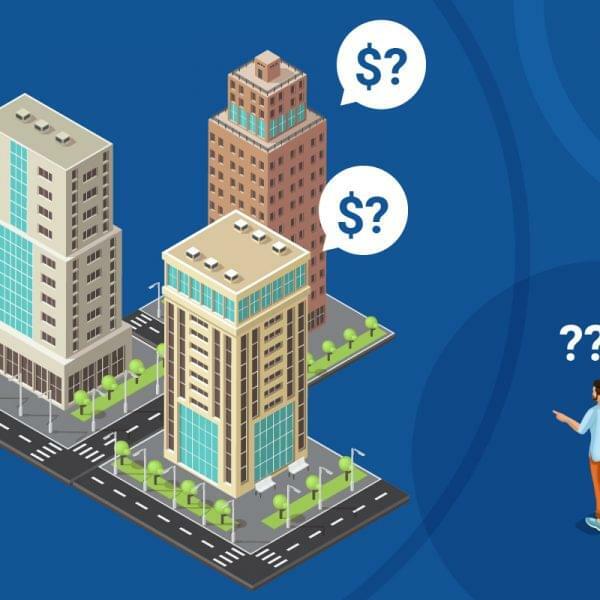 To make matters worse, Property Professionals and Developers use expressions such as “Central Business District (CBD)” and “Prime area” fluidly, to describe a variety of condos in different geographical locations (Many of which are technically non-CBD)! Many factors contribute toward consolidating an area’s status and position as part of the CBD. These include factors such as local infrastructure, office tower supply, mass transit lines, general transport links and even leisure options. 1. Historically the river was an important mode of transport and trade; therefore commercial activity concentrated around the banks of the Chao Phraya River, Charoenkrung Road and Yaowarat (Chinatown). 2. However the pressure to modernize caught-on and Bangkok faced the emergence of newer commercial, retail and residential formats. This led to the development and regeneration of Silom, Sathon and eventually Wireless/Lumpini. Shifting commercial activity to these newly developed neighborhoods. 3. The final shift occurred when Mass Transit Lines (BTS and MRT) were developed connecting large parts of the city. This has had the effect of transforming Early-Sukhumvit into a leisure and retail hub for Bangkok. 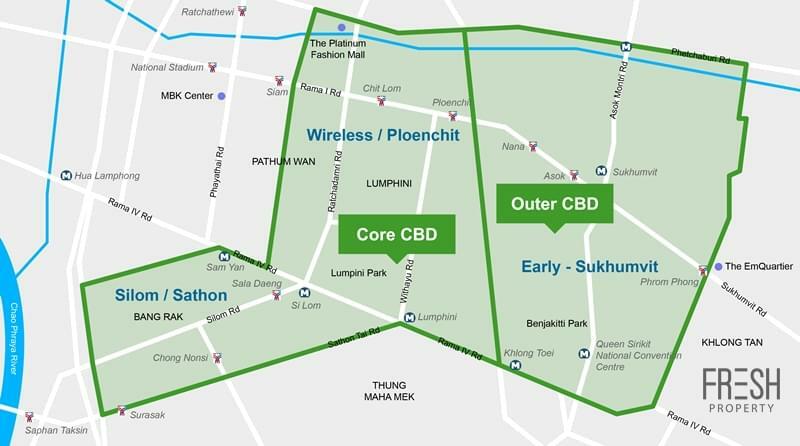 Basically comprising of Silom/Sathon and Wireless/Ploenchit (The original CBD locations); these neighborhoods host a multitude of office towers, high-quality residential options, embassies and leisure/retail venues. This area is made up of early-Sukhumvit which offers a vibrant business environment (I.e. Asoke) and a wealth of retail/leisure options (I.e. Phrom Phong). 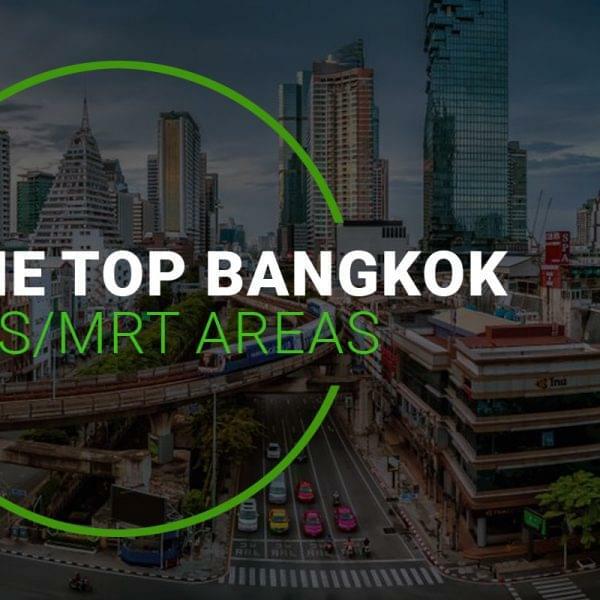 On a final note, most Property Professionals agree that the mass transit lines have firmly anchored Bangkok’s city center and the prime areas have already been established and consolidated. However the city is an ever evolving and constantly developing entity; interestingly, peripheral commercial and business hotspots are emerging throughout the Capital. *This is in no way, an exhaustive list of up-and-coming areas. It is important to note, that each area stated above is experiencing positive momentum in the form of infrastructure, commercial, mass transit and residential improvements. 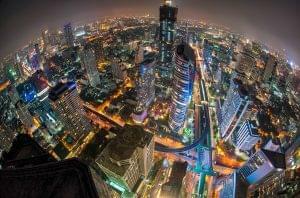 This demonstrates the enormous potential and lucrative opportunities Bangkok offers Property Investors! The Editorial Team is made up of Property Professionals with years of experience in the Bangkok Property Industry. Articles and reports are drafted using first-hand experience and local expertise! Could PropTech Fix the Real Issues of Thailand’s Real Estate Industry? Winning Condo Investments in Bangkok’s Cooling Market?